1. 本來附牆而生的大樹，在風暴期間被連根拔起；背景為香港醫學博物館 A wall tree, whose roots were peeled from its wall during the typhoon; Museum of Medical Sciences in background. 2. 塌下的印度榕，被鋸斷時在「哭泣」。 The fallen Indian Rubber tree, ‘crying’ after being cut. Our 6-storey tong lau once had a harbour view. Those views were probably lost in the 1980s when Sheung Wan’s commercial area was gradually redeveloped and built higher. Situated directly below The Peak on the corner of Po Hing Fong and Pound Lane, our building would have once been directly exposed to off-shore winds and typhoons. Nowadays, the tall Mid-levels apartment blocks further-up the hillside and neighbouring apartment buildings give further protection to our building and deflect and disperse the strongest winds. My only inconvenience during Monsoon Mangkhut’s Sunday onslaught was rainwater coming off the roof into the stairwell. This was easily mopped-up as the typhoon and the day progressed. Consequently, staying indoors, I spent the whole day reading, snoozing and doing some household chores. The ferocious whistling wind and rain rushed across Blake Garden in front of my flat, but inside was relatively calm. I have never felt any urgency, even during this typhoon, to look at Facebook and emails; I don’t have a reflex need to be ‘informed’ and ‘updated’. So, during the typhoon I simply listened to the excellent radio reports of the progress of the typhoon and sent and received some simple text messages to friends. My impression of the typhoon in other parts of Hong Kong was limited to those non-visual radio reports, as I happily also don’t have television. Finally, when the storm passed and the rain stopped at around 5.30pm, I went downstairs to clean the staircase entrance made messy by fallen pieces of concrete. I then went outside to clear away fallen tree branches and leaves blocking drains in the street around our building. I then walked around the neighbourhood. I met and chatted with a neighbour on Caine Lane, an historic path running up to the Museum of Medical Sciences. 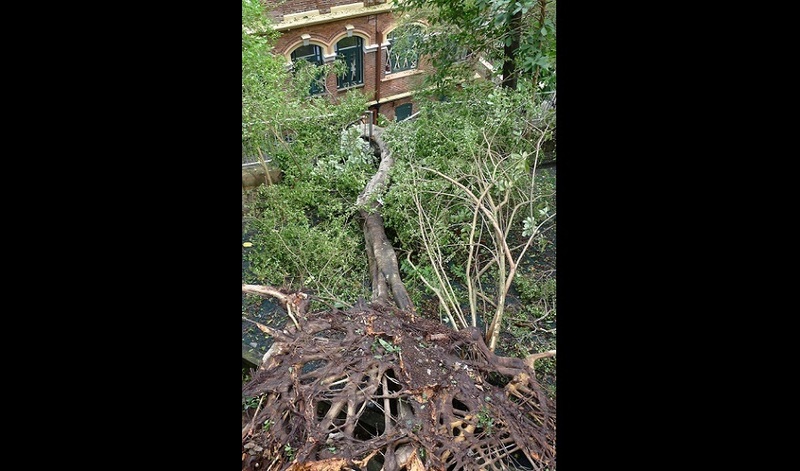 She was visibly upset that the beautiful Indian Rubber tree (a type of banyan) outside her flat had fallen over. I knew the tree well. On Monday morning, I – like many others – woke early to have a better look at the devastation in the neighbourhood. Everyone was visibly shocked and quiet seeing the violent aftermath of the typhoon. Like much of Hong Kong, we lost many trees. We especially lost some of the area’s invaluable wall trees around Caine Lane and along Caine Road in Mid-levels and upper Sheung Wan, but it could have been much, much worse: all the wall trees on Bonham Road near the David Trench Rehabilitation Centre remain and amazingly there appears to be few injuries or loss of life. I eventually came to the Indian Rubber tree. It had lived for years in the Catholic Mission School and was a remarkably beautiful tree overhanging the corner of Rutter Street and Pound Lane, just up from my home. Its destruction was like the loss of an old friend. I would walk past it almost everyday and loved it. Sometimes the school would brutally cut it back...possibly hoping to be rid of it? But, it always revived and grew again as vigorous as ever. Maybe it would have survived if it had been similarly trimmed before the typhoon. But a close look at the trunk area showed how it was holding itself up with almost no root support; concrete had strangled the space for it to expand its root network….I passed the tree again later that day after workers had started to cut it up - it, also, was crying. Eventually, later that Monday morning, I switched on my computer and saw the extent of the devastation around Hong Kong; images that everyone else had been seeing during the storm. Smashed windows, flooded flats, toppled scaffolding, water surges, wrecked boats and the photographs of crowded Tai Wai, Sheung Shui and Fanling stations of commuters trying to get to work. I felt incredibly guilty, my experience of Typhoon Mangkhut and its aftermath was relatively mild. However, almost daily, I am reminded by an odd stretch of Po Hing Fong that is just 50 metres from my flat. It is a discernible gap that has none of the tong lau, like mine, that run along the rest of the street. Now occupied by a school, this ‘gap’ has an explanation: on 17 July 1925 it was the site of Hong Kong’s worst landslide that destroyed seven homes, housing thirty families, killing 75 people. The landslide occurred after a retaining wall collapsed on the slope above, following 404mm (17 inches) of rain that fell in the four days before 17 July, as a tropical cyclone passed Hong Kong. That ‘gap’ on Po Hing Fong is always a reminder; and, Typhoon Mangkhut could have been much, much worse. This article was originally published in Ming Pao Weekly on 29 September 2018.